Status: Rare casual spring migrant statewide. Rare regular fall migrant statewide. Rare casual summer visitor statewide. Accidental in winter. Documentation: Photograph: 24-26 Oct 1995 Lewis and Clark Lake, Knox Co.
Taxonomy: Two subspecies are recognized, grisegena in Eurasia and holbollii in North America. Nebraska birds are holbollii. Changes since 2000: The number of reports has increased substantially since 2000. Prior to 2001 there were about 32 records in all (Sharpe et al 2001), but by late 2017 the count has risen to about 90; most reports are from Lake Ogallala, Keith Co. This species overwinters on the Atlantic and Pacific coasts and thus is rare in the Interior (AOU 1998), especially in spring. There are 16 spring reports, only seven accepted, all since 2001: 26 Mar 2017 Lake Ogallala, Keith Co pre-alternate molting adult, 23 Apr 2004 Lake Ogallala alternate adult, 28 Apr 2001 Lake Ogallala alternate adult, 8 May 2010 Fuchtman Playa, Antelope Co alternate adult, an alternate adult photographed 1 and 16 May 2012 in Dodge Co, an alternate adult at Crescent Lake NWR, Garden Co 18 May 2018, and two alternate adults 10-27 May 2016 Lake Ogallala (see Summer). The following additional reports are within the expected migration period and are probably correct: 7 Apr 1927 Omaha (Swenk 1933), 10 Apr 1963 Lincoln Co, 17 Apr 1984 Dakota Co (Bray et al 1986), 19 Apr 1966 Gage Co (Fiala 1970), 12 May 1992 Scotts Bluff Co, 13 May 1979 Douglas Co (Cortelyou 1979), 17 May 1967 Scotts Bluff Co, 22 May 2012 Lake McConaughy, Keith Co, and an immature in Scotts Bluff Co 2 Jun 2002. Summer: Nesting has not been recorded in Nebraska; this species is an uncommon local summer resident only as far south as northeast South Dakota (Tallman et al 2002) and northwest Iowa (IOURC 2018). Lake Ogallala, Keith Co hosted 1-2 from 10 May-17 Oct 2016 that may have been migrants and/or pre-breeding immatures. There are these accepted records: 1 Jun-24 Jul 2016 single alternate adult Lake Ogallala, 10 Jun 2007 basic adult Lake McConaughy, 16 Jun 1985 Lancaster Co (Garthwright 1985; Mollhoff 1987), and 10 Jul 2012 alternate adult Lake Ogallala. There are earlier records 15 Aug-15 Sep 2001 Lake Alice, Scotts Bluff Co, 26 Aug 2001 Johnson WPA, Phelps Co, one photographed 3 Sep 2006 Lake Ogallala, 3 Sep 2016 two at Lake Ogallala where during summer only one, then one through 17 Oct, when undergoing pre-basic molt, 7 Sep through at least 11 Oct 2000 pre-basic molting adult at Lake McConaughy, and 16 Sep 2017 Lake Ogallala. High counts: 4 at Lake McConaughy 2 Jan 2016, 3 there 3 Dec 2000, 3 at Calamus Reservoir, Loup Co 14 Nov 2006, and 3 at Lake McConaughy 29 Dec 2012. Winter: The only record of overwintering is of two adults and an immature, the latter present since 6 Nov and the adults first seen 1 Jan, at Lake McConaughy 1999-2000. 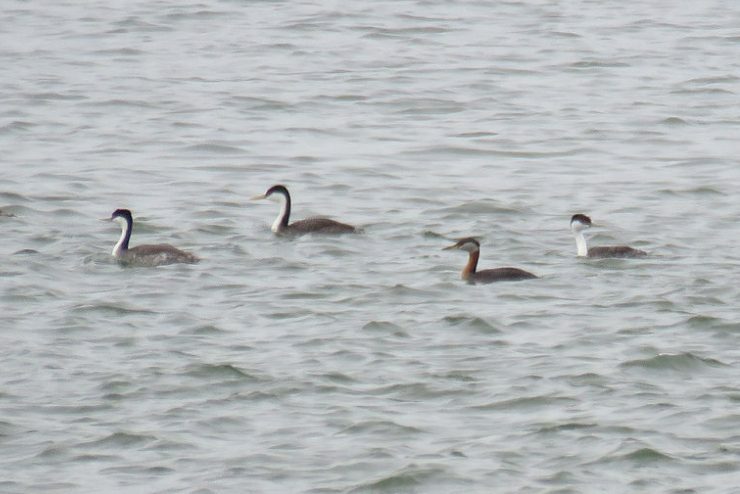 Photograph (top) of a Red-necked Grebe (second from the left) with Western Grebes at Lake Ogallala, Keith Co 24 May 2016 by Michael Willison. Garthright, W.C. 1985. Red-necked Grebe. NBR 53: 77. Iowa Ornithologists’ Union Records Committee [IOURC]. 2018. Red-necked Grebe. Iowa Ornithologists Union bird checklist, accessed 27 Oct 2015. Swenk, M.H. 1933. A brief synopsis of the birds of Nebraska. II. Grebes. NBR 1: 142-151.